Welcome to another "How it is Made"
Here is another How it is made. 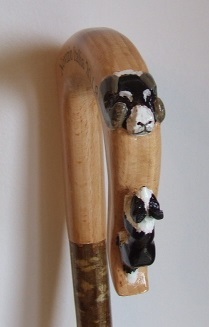 This one is a Beech wood crook with a carved border collie and rams head on the crook. Carved from the solid timber. First stage is to draw out your design on the timber which is about a inch thick or a little thicker. Then band saw out your shape. Here you can see the top of the border collie has been marked out for the areas to be removed. 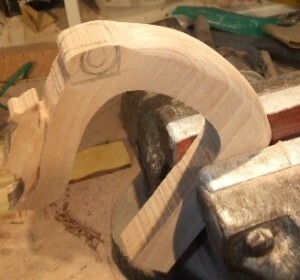 The next step ideally is to mark out the end of the neck which will be connected to the stick. The end is centred and marked ready for drilling with a 13-14 mm drill bit. The reason I like to do this early on is because at this stage the handle is still square and sits nicely in a simple jig I have for drilling the ends of handles. Without the jig the hole would not be true and the head would lean one way or the other. This just the other side of the handle. 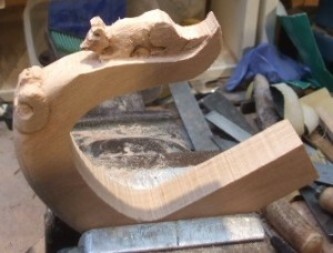 Simply marked out to guide when I start carving in the border collie. More to follow as time allows. We have now marked and drilled the bottom end of the neck and fitted a dowel, to be glued later. Note the chamfer at the end of the dowel, this leads into a flat all along the dowel which allows excess glue to be forced out easily. Here we have removed material from both sides of the block border collie. 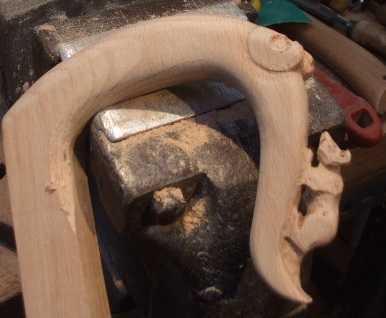 The area that will become the rams head has been marked and the top of the handle ( the crown) has been rounded so that we can start working into the rams head. Carving the rams head has been started here and once we are happy with that we will move down to the block that has been profiled for the border collie carving. More to follow. The border collie has been roughed out here , and the front and back legs have been left quite bulky to add strength to the whole, the same has bee done with the tail which will be left as thick as possible so that the nose is not too fragile. 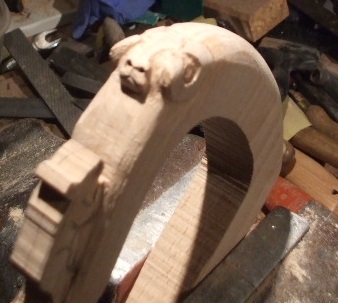 Finished carving the rams head and the border collie. 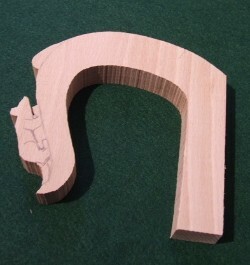 The crown (top of the handle) has now been rounded off and the corners rounded off along the nose. 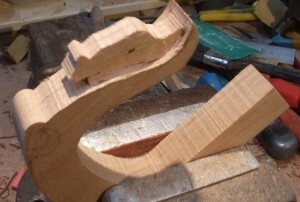 We are now ready to start shaping the neck ( thats the part that connects to the stick) . 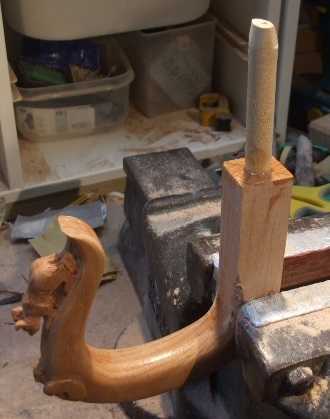 The part of the handle that has been worked now is now coated with sanding sealer and the peg glued into the handle and left to cure. 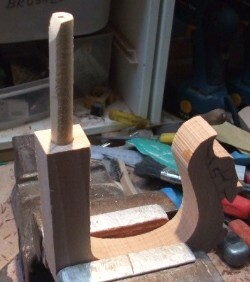 I will leave this overnight now, and when I restart work in the morning I will be able to use the peg to hold the handle in the vice should I need. Finished crook. 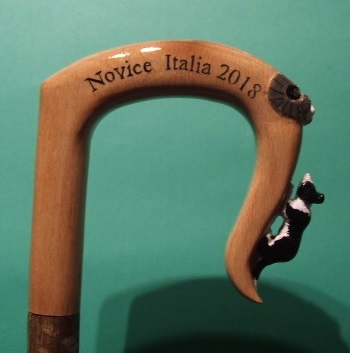 Destined for a Novice SDT in Italy and organised I believe by Filip Knops. Front view of the crook above.